The Mendelpass area is a balcony on whole groups of mountains in three different directions, the dolomites behind Bolzano, as well as the Ortler group and the Brenta group of the alps. Large groups of bikers of all kinds, motorized and unmotorized are likely to be on this road. Beware of route finding problems when trying to make a southern loop back to Bozen. From East. There are several options for the lower approach. But they all leave from the valley of the Etsch, starting as far north as Andriano or as far south as Kaltern (or even further south on narrow secondary roads). The closest metro area is Bozen to the north. Leaving Bozen towards St Paul and St Michael, you can take a bike trail from the south side of town that passes through two bicycle tunnels while climbing. These are nicely lit tunnels, away from cars and motor fumes, a whole new pleasant tunnel cycling experience. In St Michael the objective of the ride becomes visibly clear. It is the large green plateau on the west side of the Etch river. The road works itself up the plateau with methodical ramps that are like stepping stones, each one neatly labeled with a number and the altitude for the many cyclists that make the climb. The rocky dolomite spires, sitting on top of a green plateau on the other side, are visible even from the lower ramps and from there the view only gets better. The ride becomes especially memorable, once it reaches the upper cliff forming formation. Here the road becomes a long curvy shelf, and a solidly built stone fence separates the road from the drop off. Little alcoves, like bird's nests above the landscape, seem like the perfect impromptu stopping point for a bicycle, unless the traffic is relentless. Now it's several more switchbacks, these ones stacked on top of one another so that they all fit into a single photo from the top, and then the actual top is reached, where a whole town waits, complete with restaurants, an alimentari, bars, albergos and souvenir shops, even a funicular. I'm told they take bicycles, and several have been seen standing close by, but nobody admitted to actually taking the funicular. From here there is an option to climb further for an out and back ascent to Monte Penegal (1737m). From West. (described downwards). The rugged Ortler group is visible across the valley, mostly between trees. A short alternate to the main road is the ride through the town of Ruffre, which offers additonal views of the Ortler Group. Otherwise it's a very quick descent past a hotel to Fondo, and then it's time to decide once and for all wheater to continue descending south or climb back up to Gampenpass (pso Gambino). The description continues south through Ronzone, Sanzeon and Demulo. The roll through these small towns turns out to be a a journey along a balcony on the grupo di Brenta alps. Traffic is a little heavier than on the climb. If descending towards Trento or even just Mezzocorona, in order to pick up the Weinstrasse bike path back to Bolzano, the route can become very complicated, if trying to avoid the section that is closed to bicycles, because of a tunnel on the main road. 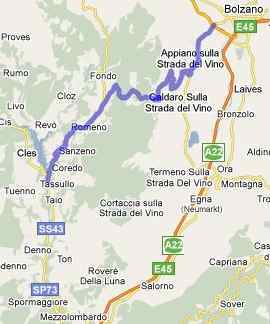 In my case the police recommended a detour through Tuenno, Nanno and Derinno to pick up the main descent back into Mezzocorona. This route is very scenic and judging from all the racers on the road very popular, but a lot longer than it looks on the map, because it crosses a canyon that many road maps do not show clearly. Mendelpass: Andrian (a few km south of Bolzano) > sightseeing detours through Sankt Paul and Sankt Michael > Mendelpass > descending along multiple wrong turns and dead ends eventually continuing > Tuenno > Nanno > Flavon > Denno > Mezzocorona > Weinstrasse bike path > Bozen > Andrian: 103 miles with 6000 ft of climbing in 8:2 hours (VDO MC1.0 m4:9.5.27). Notes: without the detours, planned and uplanned this would be a much more reasonable day ride. The bottom two picture pannels were taken on the bottom part of the described western approach, direction Nanno, Tueno and Derinno. Many other options exist.